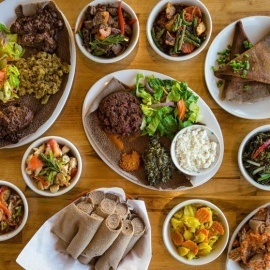 Injera Restaurant is an authentic Ethiopian and Eritrean Cuisine located in the heart of the historic Park Street in Alameda, CA. Injera Restaurant combines modern ambiance with traditional spices resulting in an amazingly tasty and flawless experience. What does the name Injera mean? Injera is a sour-dough risen flatbread with a unique texture; it is the national dish in Ethiopia and Eritrea. This spongy, flat, and mildly sour bread is used to grasp the various stews and salads off your plate thus eliminating the need for silverware. Traditionally, you tear a piece of the Injera with your hand or hands, grasp your favorite stew and take a bite. (By the way, it is also customary to occasionally create the same bite size and feed it to your date with your hands for fun. And culturally, it is a gesture of love, care and acceptance of the person). Injera is made with teff, a tiny round grain that flourishes in the highlands of Ethiopia. Teff is very nutritious and contains no gluten. At Injera Restaurant, we provide Teff based and barley mix Injera. While we offer many traditional Ethiopian and Eritrean meat dishes, we are sensitive to the needs of our vegan customers. Traditionally we prepare many our authentic dishes that are vegan, without the use of any animal products. Our produce is fresh and sauces are prepared as ordered. 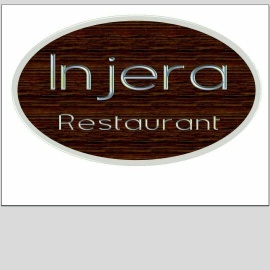 Feel the different experience and come in to the Injera restaurant to enjoy your meal!